Walking through Mumbai for an Italian student of architecture means confronting something totally different from his own culture. I am a student at the Politecnico of Milan and originally from a small village of just 2500 inhabitants in the north of Italy, Buscoldo, close to a town called Mantova, which has a population of roughly 45000 people. About a month ago I left behind my quiet life and got absorbed in the crazy world of Mumbai. I thought I was prepared. I thought I knew what a big city was, how it works, but actually I was far from it. I am in Mumbai for 3 months to do an internship at URBZ. My aim is to understand the process of incremental-improvement in Dharavi and other neighbourhoods in Mumbai. In the recent years I had the opportunity to explore different realities. I spent one year in a South American metropolis, Santiago de Chile. Chile is perhaps not such a typical South American country, because of the strong cultural and economic influence it gets from the US. Santiago is also a mad city but its sense of organization and feel is very Western. Coming to India made me realize that the last few years of my life have been a curious “Russian doll”-like experience. I grew up in a really small village, where everybody knows each other, I studied in a small town, spent time in Milan, lived for one year in Santiago de Chile in a neighborhood as big as my hometown, and now I am spending time in Mumbai which has a population twice as large as Santiago. Looking back at my village from Dharavi helps me understand better where I come from and what’s special and universal about it. 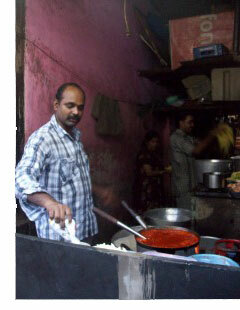 In Mumbai I stay in Dharavi, one of the most dynamic and populated unplanned neighborhoods in the Asian continent. Even if at first sight it has nothing in common with a small village like mine, I realized that reality is actually more complex. I was most impressed, for instance, with the deep sense of place and community that people have in Dharavi. I live in a small apartment in a seven-storied building and I know my neighbors because I have learned from them to keep my door open. This self-imposed rule originated from the time they all lived together in low-rise “chawls”, before their patch of land was redeveloped in the 1980s. The role that my house-front played in Italy is played in Dharavi by the hallway, which connects my life with my neighbors’ life. It is a world of social interaction which fulfills the need that we architects tend to fantasize about public spaces. That little passage from door to lift, with the small gesture of keeping doors open creates a great meeting and interaction space, which was never designed to be used that way. This is just what people chose to do. A few days ago in Dharavi, I saw Paul -one of the strong men of the neighborhood where the URBZ office is located- preparing lunch for 150 people (photo on the right). I was really surprised but also remembered that this also happens back home when we celebrate something that connects the entire community. Dharavi is a context where poverty is not a problem. In fact many families keep investing their earnings to improve their own homes. 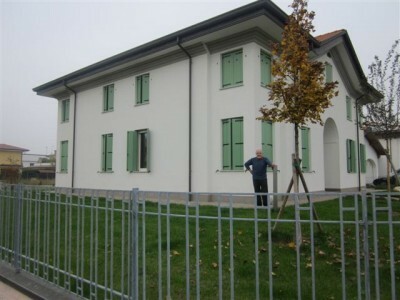 In Italy too we are interested in building up better houses and improving it. The process is very similar, what changes is the type of technology we use. I live in a house which my father built. He is a Geometra (a specific Italian technical specialization related to construction) and what he basically did for most of his life was to design houses. In this case he was like a typical contractor of Dharavi, who, together with his client tries to build or improve a house, without the help of architects or engineers. What he basically did, was take the typical single house we have in the north of Italy, and tried to redo it with different materials, mostly wood. This is new in a place where wood is not a local material, and has generated a lot of debate in the community. I have to admit that before coming here I was pretty worried, but now I understand that if we are willing to get involved in the places we visit, maybe the differences we perceive at the beginning are simply stereotypes that we have to outgrow. A trip to Auroville's Centre for Scientific Research shows a variety of possibilities for practices to place themselves in between research and on-site application.